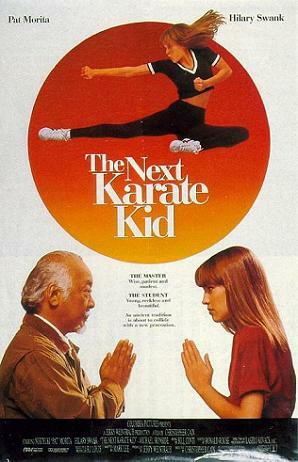 The Karate Kid trilogy was pretty intriguing. It was never as good as the Rocky films, but Daniel LaRusso eventually became a decent main character. It was always fun to see Mr. Miyagi take out some villains. This one was supposed to be a step down from the trilogy and I can definitely see why. At best, this film can possibly match up to the second Karate Kid film, but that’s about it. Why couldn’t this film take down the rest and become the best? Let’s find out! The plot involves a girl named Julie Pierce and she’s not doing very well. She’s been skipping out on class and not finishing any of the homework. She also gives her grandmother a lot of attitude, BUT she has a soft spot for animals. (Hint, this is where the audience is supposed to sympathize with her) Her parents were also taken down a while back so she’s pretty sad about the whole thing. Luckily, her grandmother is friends with Mr. Miyagi and he offers to babysit her for a few weeks. The grandmother heads out of state for a while so that Miyagi can make Julie a better person. Unfortunately, the school has been corrupted and the fighting instructor is out to get Julie along with many of the students who are on the disciplinary committee. The harassment won’t stop and while she has one friend…it’s not enough. Mr. Miyagi decides to teach her how to fight, but will Julie learn enough to take down these advanced fighters? It’s time to find out! Well, before I get into the characters, I must warn you that the film’s ending is arguably tragic. Eric had a dream to become a pilot, but it may have been shattered by the villain. Eric may still be able to follow his dream someday, but it will now be a lot harder. His really expensive and extravagant car is also blown up and the bullies decide not to pay him back since nobody can prove it. Eric really gets the short end of the stick by the end of the film and you almost feel bad for him. Julie is the main character of the film and she’s definitely a step down from LaRusso. She’s very rude to everyone from the very beginning and her scenes made me physically cringe for most of the film. Her sarcastic expressions just wouldn’t stop and her glaring at everyone got old pretty quickly. By the end of the film she has essentially changed her ways and become a much better person, but it’s hard to forget the first half. I can’t say that she was one of the better characters, but she went up from being a terrible character to a slightly below average one. She’s a little too distracted by her emotions and romance as well, but Eric is also to blame for this. Eric is the main guy in this film and he’s a decent character at best. He’s constantly trying to be with Julie and eventually the two become friends. That subplot could have definitely been written out of the film. Eric spends most of his time getting beaten up by the villains, which is definitely unfortunate for him. The final fight wasn’t very fair, but considering that I believe that he only landed one punch. I’ll never understand why the good guy doesn’t throw a punch immediately. Even the legendary Rocky preferred to get jabbed a few dozen times before countering. Mr. Miyagi is about as good as per usual. The film really wanted to show how well he could fight so Miyagi got more battles than usual. He takes on some guys in a random gas station, shows up some other guys in a bowling tournament, talks big against the evil fighting teacher, beats up the evil fighting teacher, etc. The film really tried to show us that Miyagi is the greatest fighter of all time and he’s too cool for the world. Miyagi is cool, but the hype can be a little much at times. It was definitely played up a little more than the other films. Wellll….Karate Kid 3 had a pretty intense scene where Miyagi beat three professionals teaming up soooooo….nuff said. Ned is the main bully of the film and he’s about as bad as you can expect. He’s a pretty bully who wants the girl for himself and he openly threatens people without any consequences. This is because the teacher is on his side and the teacher can bend the Principal to his will. Ned gets to stay after school at night without being charged for breaking and entering. He also tricks the cops several times and he gets away with assaulting another student with a baseball bat. (I have to say that I wouldn’t go to that school without some body armor or at least a bullet proof hat) I’m sure that we can all imagine how Ned’s big fight against Julie plays out, but you may not expect that Ned shows off his cowardice in public. He tries to start the fight with a cheap shot…which shows that he fears Julie. So much for being the big villain eh? Colonel Dugan is the evil fighting teacher who is the head honcho of this business. He beats up his students for fun and then he tells them to destroy other students. The school lets this fly for unknown reasons and none of the students are bright enough to tell their parents or the school administration. Dugan has his climatic fight at the end of the film, but aside from physical injuries….he can now head right back to the school. Some of the students quit, but I’ll feel bad for the others that are still in the group. One of the many negatives in this film is the fact that the school allows this. You could sense the bullies coming before the main character even set foot in the school. The faculty are just not aware of the situation and they don’t even seem to care. The evil teacher angle has been played up a thousand times at this point. I know that this is because this is made to be very similar to the first film, but it can still be hard to watch. There’s also a very unnecessary fanservice scene for the main heroine. It’s brief at least, but still unnecessary and it certainly doesn’t add anything to the story. One scene that felt completely fake was when Julie’s grandmother forgets what her real name was and called her Susan. This leads to the plot twist that Julie’s parents are dead and she runs off for the umpteenth time. I know that it was a stressful time, but there’s no way that the grandmother would actually mess up her name. It was just pretty lazy writing at that point. Another complaint would be Julie’s personality turn around. After jumping over the car she became a different person. Suddenly, she bonded with Miyagi over the portraits. She would take a step forward and then two steps backward. The Monks were decent at least and she got to bond with them by the end. It’s what counts I suppose! There isn’t much of a soundtrack in this film so I won’t be mentioning it. It’s pretty common for a film to forget about having a good soundtrack, but it can still be pretty sad. The ending is rather abrupt and it ends badly for a few of the characters. Julie is basically doomed as far as her homework is concerned and Eric is now missing a car. Both of them have a tough road ahead, but maybe it will be okay. Provided that the teacher is kicked out anyway, but that seems unlikely. At least the bullies will finally take a break. That also brings us to the artificial scene where the bullies suddenly get a heart. “That’s too much” and other lines like that. They just blew up someone’s car and they were giving him a pretty big beating. They didn’t seem to have a problem with harassing the main character and chasing her around the school all day. The scene happens in most of the Karate Kid films so we all saw it coming, but it still felt fake. The humanity! Finally, I have to mention the fight scenes. They’re all done pretty terribly and you can tell that the budget didn’t make it through this. 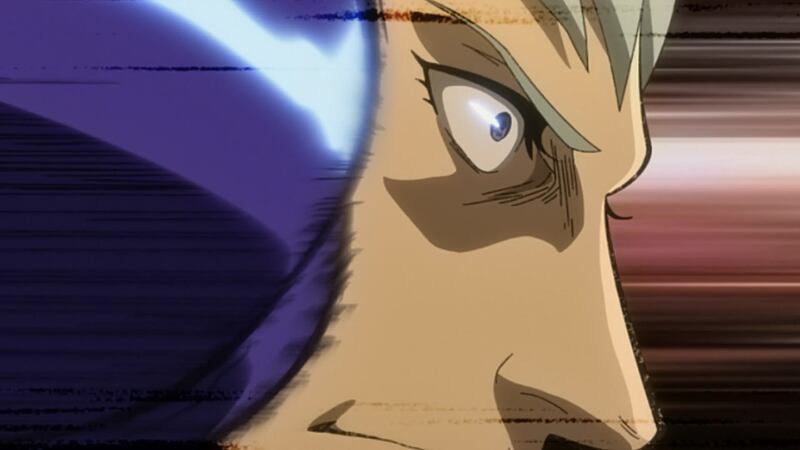 To show how powerful Miyagi is, they used slow motion on the villains. This would mean that their punch comes in really slowly to make Miyagi look fast in comparison as he breaks their arms and twirls them around like nothing. Miyagi humiliates all of the fighters, but there really isn’t any choreography. He’ll just flip them and punch them until the villains are down for the count. A show with a TV budget could make more realistic fights, but that’s arguably the charm of Miyagi. At any rate, the fight scenes are amazing compared to the rest of the film. Overall, this isn’t a film that I would really recommend to people looking for some action. 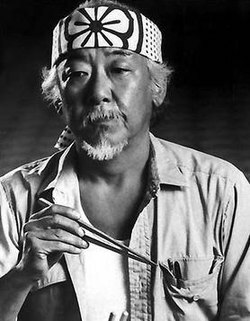 Mr. Miyagi is really the only good character in the film and his fights are the best part. The Hawk is good and I’m glad that the animal violence never occurred because the film couldn’t lose too many more points. The film just isn’t very enjoyable to watch and the romance didn’t help matters. Bullies are everywhere, but I’d like to see a real student council for once. One that isn’t corrupted. Instead of watching this film, go check out Rocky with its true fight scenes!